The time has come to update my net worth and portfolio once again. As a dividend growth investor the absolute value of my assets is subordinate to the fresh cash that they throw off each month, but seeing my net worth grow month after month is fun nonetheless. I think it’s fair to say that everyone loves seeing an upward-trending graph when money is concerned, unless you’re in debt. I am incredibly fortunate that my progress the past few months has been nothing but stellar. That upward-trending graph I was talking about shows signs of exponential growth, which means the power of compounding interest is already working in my favour. On top of that, an increasing numbers of dividends are rolling into my accounts each month, thus providing me with more cash to pour into the stock market. February’s passive income, for example, increased my savings rate by 1%. 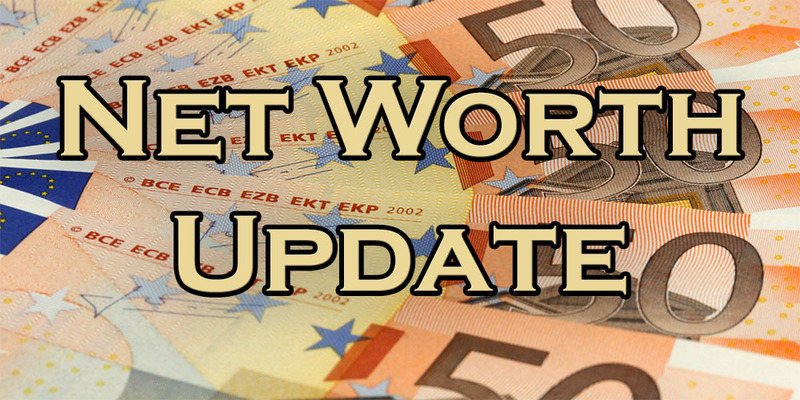 Even with the high income tax that I’m subject to in Belgium and a pretty heavy withholding tax of at least 25% on all my dividend payments, you’ll be surprised to hear that my net worth jumped with another massive €2,606 this month. That’s about 30% more than my job’s monthly salary. As a result, I thought it appropriate to write a post on why taxes don’t bother me too much and that I actually enjoy paying them. Although the article turned out to be quite controversial, as the heated and in-depth debate in the comment section shows, I still stand by what I said. Not only do you get to contribute to society through taxes, but when Mr. Taxman takes a bigger cut in absolute terms it simply means you made more money – and what’s wrong with that? March’s growth spurt of 4.44% marks another month in which my portfolio, in tandem with my savings rate, managed to build over 200 hours of work-free capital. That’s 25 days my future self won’t have to spend at the office making €12 an hour after taxes. Simply amazing! Below you can find my portfolio as usual. It’s made up of individual dividend growth stocks where most of my investing focus lies for the time being, of exchange-traded index funds, and of safer investment vehicles and a small pension fund. Foreign stocks were converted into Euros using the last-known exchange rate. With the European Central bank launching its Quantative Easing programme this month, it comes as no surprise that my dividend growth portfolio shot up in value again considering that most of my dividend stocks are located in the United States, the UK, and Switzerland. When the Euro tumbles, my international stocks show an inversely correlated movement. That’s why you’ll see a lot of green in the list below. The only two stocks trading below my purchase price are oil tycoons Royal Dutch Shell (AMS:RDSB) and Total SA (EPA:FP). The fact that they’re the only two of my holdings denominated in Euros is completely incidental as the European stock markets outperformed themselves the past month. Now that I have a Euro Dividend All-Stars list at my disposal, I’m going to put more cash to work in European companies over the coming weeks. I wanted to purchase more EU equities sooner, but my analysis of Swiss pharmy company Hoffmann-La Roche (VTX:ROG) made me decide otherwise last month. That’s why you’ll find five shares of the Roche Holding listed below. Index funds and their stock market-based counterparts exchange-traded funds have just one job: to track a certain index and keep up with its performance. They require a set-it-and-forget-it approach that many new investors prefer over active investing choices. Just like with my individual stocks, my ETFs have gained quite a lot again due to the ECB’s QE, as you can see. There’s not much to say here. Like every other month I invested another €77.5 towards my personal pension fund that allows a contribution of up to €930 for 2015. My savings account and the emergency fund remain unchanged from last net worth update. At the moment the annual gain of my portfolio comes out at a little over €9,000 already. That’s insane considering the year has just started! 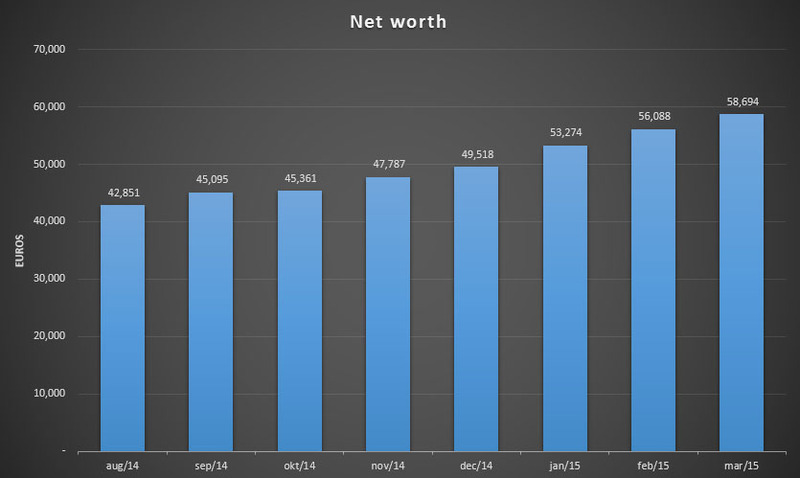 When I first set my 2015 goals I expected to reach a total net worth of €70,000 by the end of the year. In over two months I’m almost halfway in building the necessary extra €20,000 to make that goal. The financial markets make me look like a hot shot investor even though it’s pure luck. You won’t hear me complain though. If the major stock indices don’t decline over the coming months I will crush this year’s goal of €70,000 in net worth. While that’s great, it doesn’t help my future dividend income all that much. More expensive stocks means I buy them at a compressed yield, lowering my future income as a result. That’s why it’s important to keep my savings rate up to make every dividend stock purchase as meaningful and large as possible. Thank you for reading! Be sure to let me know how your portfolio and assets are performing. Way to go, NMW. Thanks for sharing…its always great to see and read your progress over the months. Im also glad to hear that you are on track to crush €70,000 by the end of the year. Thats a great achievement for someone so young. Thanks, pal! Just like you, I like following everyone’s progress. Amazing how much we’re all achieving in so little time. Great post NMW. You’re doing very well my friend. You’re laying the bricks to a solid foundation and soon enough, it’ll become a massive fortress. Keep up the great work and hustle hard while you can. You’ll be glad you did and thank yourself later. Take care my friend. Coming from you, what you said means a lot to me because you show what consistently saving and investing can do over a long period of time. Can’t wait to get my net worth up to your level! Impressive! As a fellow euro-based investor I am interested to hear if you have any plans to expand your portfolio with some Euro DG stocks? Thank you! Glad you stopped by and decided to leave a comment. I most definitely am! Over the next few months I hope to at least add Home Invest Belgium (HOMI), Munich RE (MUV2), Kinepolis (KIN) and some more Shell (RDSB) to my portfolio. Over time, I would like to own the majority of the stocks currently in the Euro Dividend All-Stars list I maintain. Which European stocks are you currently invested in? I am so proud of you and your sucess, it’s so nice to see someone that young doing what you are doing. I wish I would have done the same when I was you age! I would have probably retired by now! Well done and keep on. Thank you very much for the kind words, I really appreciate it. It’s comments like this that push me ahead and make me want to do even better. Don’t dwell on the past, buddy! We should only be looking forward. For you financial independence is right around the corner – you’re doing fantastic. Two months ago I would have said that it will be difficult, but now I’m farily certain. Even if the markets drop a little, my fresh savings should cushion a blow. Too bad €100,000 is way out of my league… Maybe next year? I’m still looking at British stocks, but with the Euro down so much I’m going to buy some more in other European countries. Besides, my portfolio is already quite heavy on UK stocks. Thank you! My own experiences show that saving and investing does wonders if you stick to it. I hope others find this inspirational and decide to do the same. Like I’ve said to RA50 already, don’t dwell on the past. It won’t help you in any way propel yourself faster towards FI. And Lord knows I’ve made my share of ‘mistakes’ in the past too, ha. Yeah, I know… I only started buying stocks in the beginning of 2014. This year I have added funds and really started to look for value stocks instead of trying to capture the waves of dodgy American stocks. Last year I had a profit of 5 % over the entire year and for the first 2,5 months of 2015 I’m at 27% so I guess my new tactic is working (thank you Melexis 🙂 ). Of course the stock markets are soaring the past few months so I’m a little afraid for when the correction (or crash?) will come. Congrats with the huge growth NMW. Great motivation for me to keep working hard to ensure mine would grow as well. One quick question though, what is your reason why keeping quite high balance of your fund in 3.15% saving account? Is it for if market correction comes? hi BSR, I’m more curious which bank is giving 3,15% on your savings account? Here in the Netherlands all big banks are lowering the interests almost every month. The average interest here is now about 1%, and it looks that it will go to 0% !! Like I said in response to BSR it’s not a regulated savings account, but life insurance (Belgian tak21). At the moment I can use it like a savings account, however, so that’s why I list it like one on here. Interest rates look to decline even further, like you said. I think the legal bottom of 0.1% guaranteed interest is in sight for many large banks in Belgium…. I wonder if that will drive even more people towards the stock market. I’ve been looking for a high-interest savings account and the highest interest I could find was 2% annual at PSA Bank (Peugeot-Citroën’s financial branch). Another option in Belgium is KBC’s Start2Save, which offers 1%+0.75% but has a €500 monthly contribution limit. Ha, exactly what I wanted to hear! It thrills me that you find my posts inspiring and motivational. The 3.15% savings account is actually a typical Belgian life-insurance account, but it sort of works like a savings account. That money goes towards a downpayment for an appartment in the (near?) future, so I’d like it to be 100% safe. That’s why I’m not shoveling it into more stocks, even though I could probably make more money that way. Besides, the 3.15% guaranteed interest rate is really good in the current climate. Got a letter last week from the insurance company that they want to buy me out for four times 2014’s interests simply because it’s becoming difficult for them to keep up with the low interest rates. Not sure what to do with it yet, but I’m going to write a post soon. Great update, NMW. As per others, it looks like you will destroy your €70k target! It must be so good to see that your focus and hard work is paying dividends (literally!) and is all going towards your goal and you can already start seeing the results. Keep it going! It sure does seem like it! Incredible what can happen in just two months. And the best thing is that I hardly had to do anything – the large majority of my gains come from smart financial decisions in the past. Let’s hope our hard work continues to pay us both dividends, ha! I used to buy used iPod, iphone on craigslist, then sell them for $50 and up in profit. It was kind of cool. I don’t do this anymore as the market has gotten very saturated. A friend of mine has daughter that also making a small profit by placing abandon pets to the right owner. She also collect cages and currier and then sell them. Considering that making over €2,500 on a consistent basis every month would be my absolute limit for the time being, I think you agree that €100,000 isn’t possible this year. I feel like 2016 will be the year for me to crush the magic €100,000 barrier! The side hustles you name are all very nifty ways to make an extra buck here and there, but sadly I don’t have the time to look for deals, then resell them online. I know it’s not that much work, but my agenda is packed as it is already. The other great thing about your increase this month is the hard work for much of it was done by Mr. Market who worked around the clock to increase your next worth! That’s about half of your overall gains this month I think. Congrats on a great month – it’s awesome watching the numbers increase each month! Exactly right! Much of this year’s growth is simply because of excellent market returns. Almost all of my holdings are way up, which isn’t a coincidence with the Euro’s ten-year low. Too bad a net worth increase doesn’t really help on the dividend front, but I’ll take what I can get. Thank you for your continued support, it means a lot to me. The good thing about the principle amount of your underlying securities going up is that usually that means the companies are doing well and earning more money, thus leading to dividend increases down the line. Many of my shareholdings have performed well over the past few weeks, but the majority of the gains comes from a tumbling Euro. Where I was paying €1 for $1.35 back in August of last year, the exchange rate now goes at a measly $1.05. However, that also means that many European companies will see their profitability rise due to favourable exchange rates. That’s why I’m sure that dividend increases are a sure thing in the future! Great job increasing your net worth by 4.4% throughout the month of February. Glad to hear that you are on track to crush €70,000 by the end of the year. Truly a great achievement for someone so young. Can’t wait to see what your dividend income will be for the month of March. It’s incredible how fast I’ll be blowing through the €70,000 threshold that I set for myself by the end of the year. And all that because of smart past decisions and some help by Mr. Market. Dividend income is ticking up nicely and March is going to be another big month, I’m sure. Thank you for stopping by and taking the time to leave a comment, much appreciated. The strengthening dollar really helped you this month. Glad to see you are doing well. Keep it up! It surely did! Long live the US Dollar, I guess! Nice jump there. I just noticed your goal tracker on the side there. I might need to do that too. Savings at 69% so early in the year. Wow. I’m glad you noticed the goal trackers. They help showing new visitors what I’m about and how far I’ve progressed, but they also keep me motivated because they’re always in my face when I’m writing for my blog. You should try out something similar, you won’t be disappointed! Looks nice. I am sure you’d trade some of that value for more dividend income, but it definitely helps you to sleep at night. Dividend growth investing helps me sleep like a baby. There hasn’t been a single day that I’ve wondered whether what I am doing makes any sense. 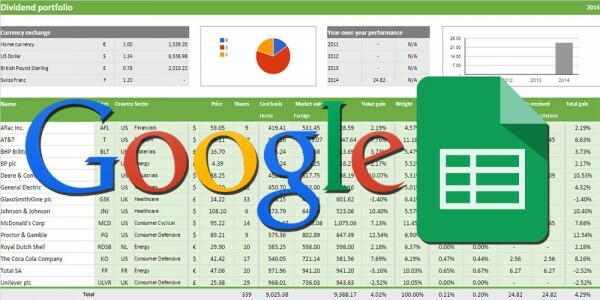 So many others are showing that DGI is a viable strategy and since a couple of months I’m experiencing the same thing. Let’s hope we can both enjoy the DGI tailwinds for a long time to come. Holy molly your net worth is growing nicely. Continue doing what you’re doing and you’ll be doing pretty well in a few years down the road. Growth has been incredible, a bit surreal even. Over €9,000 in gains this year alone and I’ve only taken home about €4,000 from work in the same time frame. Too bad that also means stocks are getting more expensive! Performance has indeed be great so far this year. If I keep this rate up I’ll be financially free before my thirtieth birthday, ha. Nice jump in your net worth. I didn’t know that taxes were so high in Belgium. I’ve always been under the impression that they were pretty low. Taxes have always been among the highest in Europe, and as a result around the world. You make me wonder how or where you got the impression that they were pretty low? The only difference with many other countries is that our government doesn’t levy a capital gains tax, which is a great way to build wealth over time for index fund investors, for example. Yeah great stock picks and entry. No red is impressive. Congrats on a good month NMW. How could somebody so young could be this rich already? I wish I was this responsible like you when I was your age! When I was 25 I was playing video games, going out with friends, buying nice stuff. Hey great job man, you still inspire me on saving and investing even I am a decade older than you. What makes you think I don’t enjoy video games, go out with friends or buy nice stuff once in a while? 😉 I actually play video games way too much, although it’s been declining lately because of a lack of time. You should see my game collection. Thank you for the kind words, though. I “blame” most of my wealth and frugal mindset on my parents, who always forced me to save 50% of any money that I earned. I guess it stuck with me so much that it became a habit. 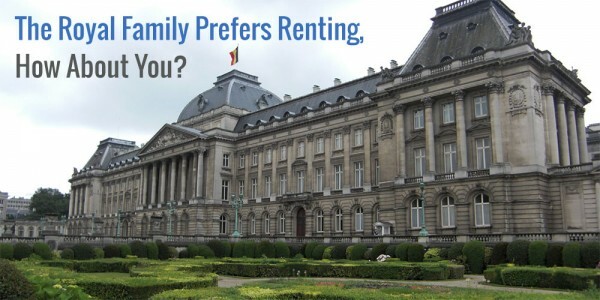 Besides, life is dirt cheap in Belgium if you want it to be, so it’s not hard to save as much as I do. Totally rocking it NMW. An inspiration, as always! Thank you for the kind words, Josh! My portfolio hardly contains andy financials, so nothing to worry there. Oil companies were down again, as you can see in my Shell and Total holdings, but most losses were offset by exchange rate hikes overseas. Congrats on the achievement! Looking at your shares/etf split and considering how well your etfs have done (and how easy they are to handle), why do you bother with individual shares at all? I appreciate you taking the time to leave a comment, thank you. 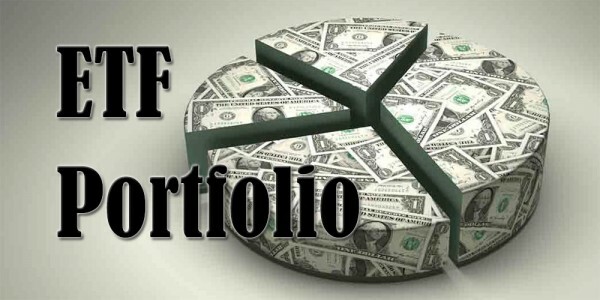 The growth of my ETFs and my dividend portfolio can’t be compared one-on-one. First, the ETFs were bought before the individual stocks, thus giving them a longer period of time to accumulate. Second, the individual stocks only show the capital gain, not the dividends I’ve received (and re-invested) over time. Furthermore, dividend growth investing is a strategy that keeps my mind in the game and focussed on the end-goal way more than index investing. The monthly fresh income provides a big boost to my motivation, whereas the ETFs are a little to passive to my taste. It’s a personal preference that probably results in some trade-offs, but one that I’m glad to make because I feel better about the strategy I’m currently following. Thanks for your reply, NMW. Have you calculated how you would have done if you had put all your money into ETFs? It’s very likely you would have done better, I reckon except you’re one of the lucky ones who actually beat the market with your smart investments (congrats in this case). There is nothing to say against active bets here and there, and — as some might call it — gambling at times; I just doubt it’s wise to do so with one-third of your net worth. I haven’t calculated my performance if I had gone with ETFs, but I believe the result would be a little bit better indeed, especially since index funds are better from a tax perspective. However, I don’t really care about beating market performance. The most important part of investing is feeling good about an investing strategy, which is why DGI works a little better than ETFs for me. Gambling is putting it too strongly. I am 100% with you that active investing could possibly yield lower returns over the long-run, but I’m only going for high quality businesses that I hope to own until I die. Furthermore, many of the companies in my portfolio are also staples in many ETFs, which is going to increase even more as I continue to diversify. Thank you for your questions and input, I really appreciate it! Nice improvement. It would certainly be nice to be able to see those kinds of gains every month. Nice move. These kinds of gains every single month would be absolutely fabulous! Too bad that’s impossible though, but that won’t stop me from dreaming.